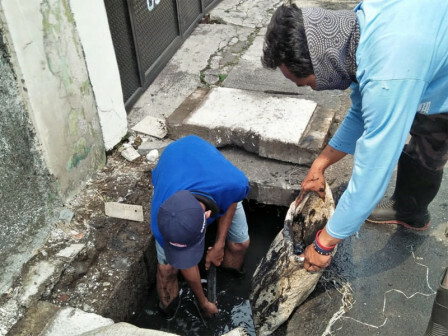 A connecting channel that is located on Jalan Budi, RT 13/03, Cawang Urban Village was cleaned.
" We clean the channel to follow up the locals' aspiration and reduce puddles when it rains"
"We clean the channel to follow up the locals' aspiration and reduce puddles when it rains," said Kramat Jati Sub-district Water Resources Executing Unit Head, Muchlis. Before being cleaned, the mud thickness was between 30-40 centimeters with 80 centimeters depth and 40 centimeters width. Right now, its depth only left 40 centimeters. "Hopefully the channel could accommodate water in large quantities" he stated.